Since the classes opened they have been very successful in the Myshall area with classes increasing in size each year. The pupils were all very eager to learn the art of Irish Dance from the very beginning. The Myshall class consists of boys and girls from 3 years upwards. All the pupils are given the opportunity to compete in the Feiseanna throughout the country and to complete grading examinations. To date, the Myshall dancers have achieved great results in all the Feiseanna and in 2007 reached the standard to compete in solo and figure dancing the Leinster Championships held in Dublin and the All-Ireland & International Championships held in Ennis, Co. Clare. The hard work paid off as prizes were won in both competitions. The first grading exams were also taken by the dancer in December 2006 and all of the Myshall dancers achieved First Class Honours. Those exams involved solo dancing, figure dancing, oral knowledge of Irish Dance and Oral Irish. The Flanagan/Kirwan School also offers their pupils the opportunity to dance in Feiseanna overseas. 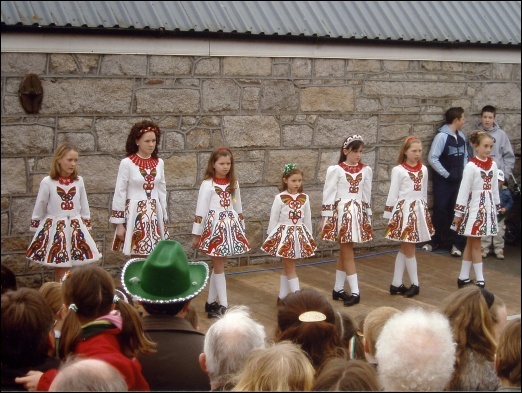 In October 2005, the dancers competed in a Feis in Glasgow and all of the dancers won prizes galore! A fun weekend was had by all! As can be seen from above, Myshall has been very rewarding for both dance teachers and they can hope it will continue for many years to come.